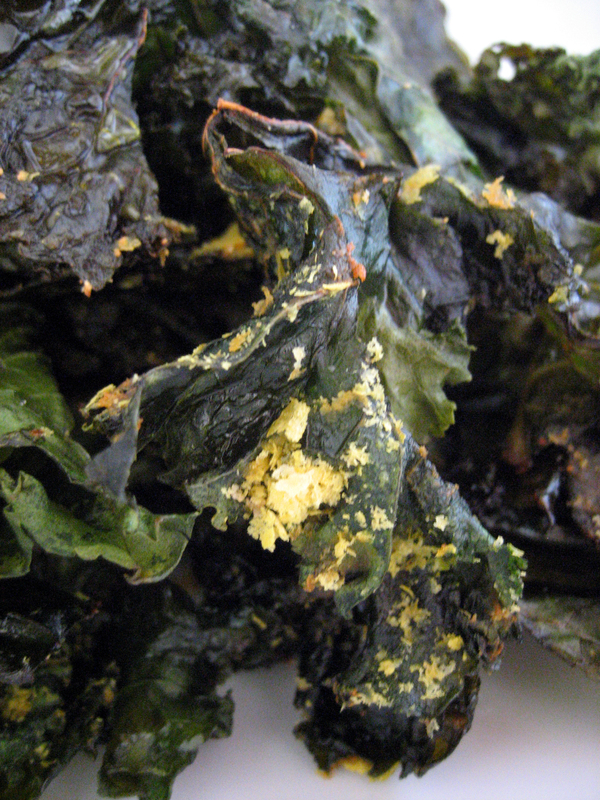 Kale chips have been the rage recently and with good reason. Compared to the potato chip, kale chips knock the spud flat when it comes to nutritional value. Dress them up with some healthy olive oil and sprinkle with protein-rich nutritional yeast and you have a brilliant snack! I like to marinate mine overnight prior to baking so that they are exceptionally crispy and satisfy that potato chip craving completely because the olive oil has time to permeate the kale. Cut kale into potato chip-sized pieces and put into a gallon-sized ziplock bag. Add the olive oil and apple cider vinegar. Close the bag while deflating it of excess air. Massage the kale with the olive oil and vinegar until it is well dressed. Place in the refrigerator overnight. Place the kale onto cookie sheets, making sure to leave space around the pieces so that you do not steam, but rather roast them. Sprinkle with a desired amount of nutritional yeast and garlic powder. Bake for ~20 minutes or until crispy. Enjoy fresh out of the oven while they are still warm and crunchy!